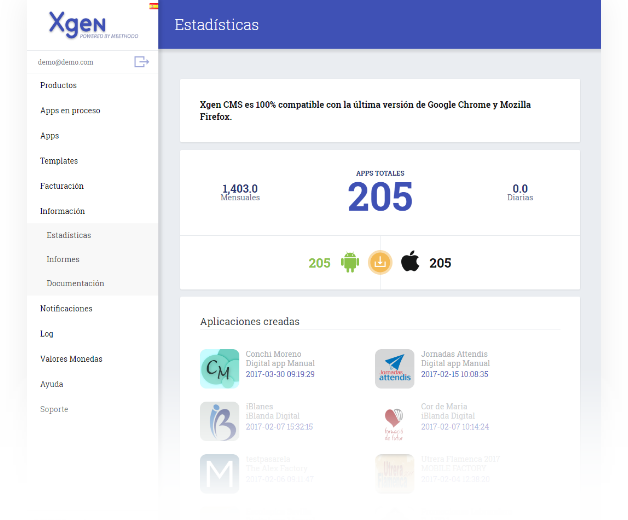 Thanks to our App Generator, any company can offer each of its customers a 100% native iOS, Android app and a responsive website with more than 150 functionalities. Our solution allows you to offer with your own brand (white label), apps and personalized websites for your clients. You can offer it as a new service to build customer loyalty. Increase your revenues by being able to be marketed as another product of the portfolio. It gives to your company an image of improvement and commitment to R & D.
It is a product aimed at companies that have as customers a significant number of companies or businesses: Software providers, mobile operators, associations, service providers and domains, cloud services, hardware wholesalers, etc. It is the reduced version of Enterprise Generator, intended for companies that want to enhance their products or services, as well as to retain their customers, providing digital value. It is designed for temporary work companies, private security, banking, associations, groups, wholesalers, etc. Product: An application for each client in their portfolio, to improve internal communication with employees. Marketplace is an application to integrate the information, services and functionalities of hundreds of applications, made with the same generator, Enterprise or Solution. 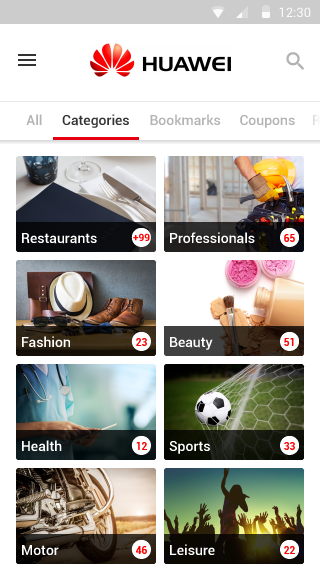 The user of the Marketplace app, finds the information, services and other options, sorted by categories and with a filter for the services near to their position. Each of the businesses that appear on the Marketplace also has its own custom app and web. Marketplace Solution, generates an important Big Data, that benefits the app users by the concentration of promotions and services, and the owners, by allowing non-regular customers of their business to have direct access to them. Marketplace is a very interesting tool to add value, build loyalty to a distribution channel, or groups of end customers SMEs of a brand or company. 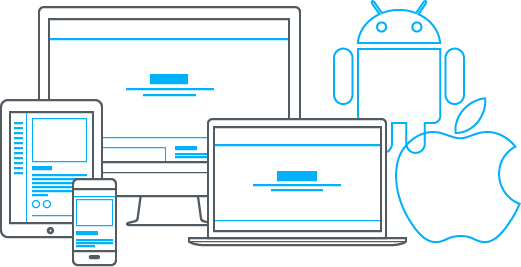 You will be able to generate applications with all these native options for iOS and Android. The most complete CMS mobile for our apps and responsive webs, with hundreds of customization options, real-time statistics and a cutting-adege push platform. All webs and apps can be managed by the clients themselves, using the Meethodo's own multi-language CMS, with on-line support, to connect and seduce users with targeted messages, promotions, surveys, news, events, becoming In the best mobile marketing tool and analytics. You have options like send push, edit content, menu, design and functionality , both before and after the app is published in the markets. 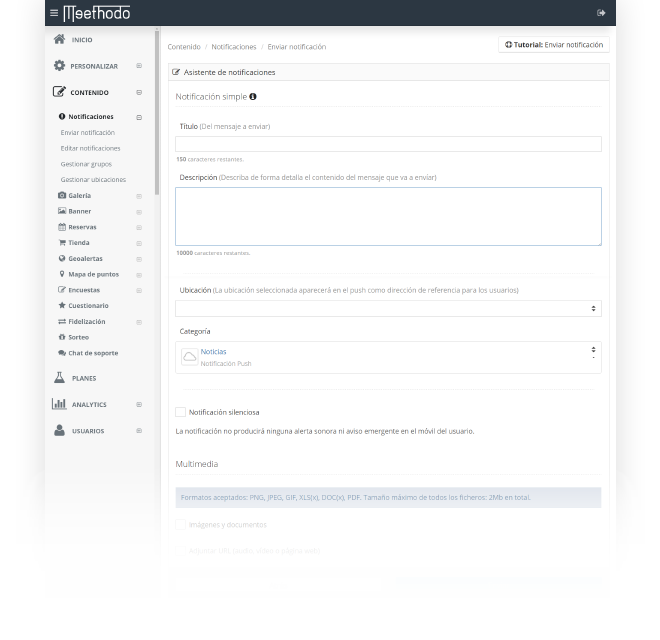 A complete CMS to manage the publishing and billing of the applications you generate with your App Factory. You will be able to create and edit default application templates, control their publication status, assign prices by model, query statistics and many other useful management tools. Build your complete mobile business. Are you interested in creating your own Apps Factory? Send us a message and we will get in touch with you to give you all the information. We inform you that this website uses both first and third-party cookies to improve our services by analysing your browsing habits. You must agree to its use. You can change the settings or get more information about our Cookies Policy here.